Pack The Gym – Pack the gym night was a HUGE success last week. The energy our crowd brought was Amazing. Everyone who attended this event was talking about how special it was. We has a truly unique entrance for this big game. I’m not sure there are many High Schools out there that put on such a show. To check out the intro please click the link below. A Motorcycle in the Gym??? Click the link to see how we pulled this off. Boys Basketball – The University Boys Basketball team had a great week garnering victories over league rivals Woodbridge and Irvine. Last Thursday the boys led from start to finish and defeated Woodbridge 74-61 on “Pack the Gym” night in front of a great crowd. Senior guard Kiron Dey led the way with 21 points, 12 rebounds, and four assists. Senior forward Tyler Cashman added 11 points while sophomore guards Kevin Yahampath and Alex Bray scored 11 and 10 points, respectively. Yahampath also contributed seven assists. On Tuesday up at Irvine the Trojans again led from start to finish in defeating the Vaqueros 96-75. UNI had five players in double figures led by Tyler Cashman’s 19 points. Kiron Dey added 18 as did senior guard Justin Wu who also made five three pointers. Junior forward Ryan Pham came off the bench to score 17 while Kevin Yahmapath scored 14 points to go along with his ten assists. The Trojans start the second round of PCL play tonight at 7:00 p.m. in the gym against Beckman. Please come out and support the boys. Girls Basketball – After a heartbreaking loss to Woodbridge last Friday night the Lady Trojan basketball team bounced back to defeat Irvine in a very close game 52-51. Allison Piper lead the Trojans with 13 points and 9 rebounds. Malia Goldsmith added 12 points and Kaci Blailock had 10 points. The girls basketball team hosts Beckman tonight at UNI at 530pm. Good Luck Girls! Boys Soccer – Our boys fell to Woodbridge 2-0 last Thursday. On Tuesday our boys bounced back with an impressive 8-2 victory over Irvine. Pedro Palmaka and Sam Kelley both netted two goals. Riley Duncan, Erick Mumm, and Adam Eldefrawry also each scored a goal. Supplying assists on the goals were Sam Kelley (2) Ivan Ma, Pedro Palmaka (2), Bardia Movafagh, Rio Gibson, and Sebastian Hertel. Our boys kick off round two of league play this afternoon @ Beckman. Good Luck boys! Girls Soccer – The Lady Trojans finished the first round of league play on a strong note with wins over Woodbridge (3-0) and Irvine (3-2). The Woodbridge game was a dominant performance from the team. They went ahead on a goal from Paige Metayer and never looked back, with Kiana Ghamari and Leyna Wood adding insurance goals. Against Irvine, Uni really had to work, falling behind twice, but a beautifully placed assist from Kiana Ghamari (her second of the night) found Paige Metayer inside the six yard box and she coolly placed her shot in the back of the net to put the team ahead with only three minutes remaining. The team sits in third place and kicks off round two of League play with a home match against Beckman today (1/28) at 3:15. Come out and support our girls! Girls water polo is 13-10 on the season and 2-3 in league. Last Thursday the aqua Trojans beat Woodbridge at our UNI pool by a final of 10-8, however the ladies had a tough time this past Tuesday at Irvine H.S. losing 13-7….the team will be back in action this afternoon hosting Beckman at our UNI home pool, varsity game at 4pm. Come on out and support our girls. Wrestling – Trojan Wrestling faced the Woodbridge Warriors for second in league duals last night at Uni. Seniors Ibrahim Takesh and Danny Gilbertson both lead University with early pins, but it was Freshmen Ethan Chin and Kohl Hertz who brought the victory home with wins in tough, hard-fought matches. Uni seemed unstoppable from the beginning with a win from Ethan Manniss (10) in the first match of the dual. With a second in league finish, the Trojans hope to take it to the first place Vaqueros this Saturday at league finals. Help spread the word about Trojan Thursday. Is there anyone you know who loves UNI and wants weekly updates on our UNI athletic teams. Please pass the link on to them. If you would like to receive Trojan Thursday each week please go to https://unitrojanthursday.wordpress.com and type in your email address. You will receive a notice each week when Trojan Thursday is posted. The Boys Basketball team won last Friday’s Pink Out game by a score of 89-85 in double overtime. It was a back and forth game with a great crowd from both schools. Kiron Dey scored 34 points and grabbed ten rebounds to pace the Trojans. Sophomore point guard Kevin Yahampath iced the game with two free throws with 2.5 seconds left. Justin Wu scored 13 including a big three pointer to start the second overtime. Sophomore Alex Bray added 19 while Yahampath had 14 assists. On Monday, the Trojans won over Westminster 102-67 in the first Mike Longshot Cancer Challenge at Costa Mesa H.S. Uni had five players score in double figures led by Dey who scored 26. Wu added 17 while junior guard Joe Christensen scored fifteen points all on three pointers. Seniors Tyler Cashman and Ishan Gujral added 12 and ten points respectively while Yahampath had 11 assists. The Trojans return to action tonight for a big game at home against Woodbridge on Pack The Gym Night. We hope everyone will be able to come out to this big game. After opening up league play 0-2, the Lady Trojans bounced back with an incredible win over the first place team Corona del Mar 57-51. This win took the whole team, but Allison Piper led the Trojans with 17 points, Malia Goldsmith added 10 points and Laura Nolan also added 10 points. Great win ladies, not keep it up!! Our girls will be playing in their GOW tonight. ITS PACK THE GYM NIGHT. Come out and support our girls tonight. Tip is 5:30. Boys Soccer – Our boys soccer team fell to CDM last Thursday by a final of 2-1. Goal by Riley Duncan and assist by Kian Mohseni. Our boys are back on the field this afternoon playing at Woodbridge at 5. Good Luck boys. Girls Soccer – The Lady Trojans saw a glimmer of success in league play, tying Corona del Mar last Thursday. Despite losing Kathy Guo to a serious ankle sprain early in the first half, and enduring some heavy pressure from CdM late in the second (kudos to Kerri Luttrell, netminder, for some key saves! ), the girls held on for the tie. They generated a lot of offense in the first 65 minutes of the game, including a four shot scramble in from of the CdM goal, but were unable to find the winning goal. The ladies are in action today with a big match against Woodbridge and round out the first half of league play against Irvine on Tuesday next week. Good luck girls. Girls Water polo – The Lady Trojans water polo team has been taking it a little easier than normal this week in training, in order to stay fresh and fully concentrated on academic final exams. The team will be back in action this afternoon @ the UNI pool as they compete against league friendly rival Woodbridge, varsity game at 4pm…UNI’s record is currently 12-9 (1-2 in league)…last Thursday the team hosted CDM and lost 18-7, however on the positive side…it was the first time in over 7 years UNI scored more than 3 goals and gave up less than 20 against the juggernaut CDM…we are narrowing the gap and will continue to make improvements in the near future….next week we travel to Irvine H.S. on Tuesday Jan 26th and host Beckman at UNI pool on Thursday Jan 28th…varsity games at 4pm usually. Snack Bar will be open. Good Luck Girls. Boys Soccer v Irvine – 3:15 – THIS IS THEIR GOW – Come out and support our soccer stars! PACK THE GYM NIGHT – Tonight is our yearly Pack the Gym Night. This is one of if not our largest athletic event of the year. Gather up your family and friends and throw on a light blue shirt and come out to the gym to watch these amazing games. The atmosphere is electric. PACK THE GYM T-SHIRTS $5 – Our UNI Basketball “THIS IS OUR HOUSE” shirts are available in the athletic office for only $5. We want everyone to be in blue for this big night. If students wear the shirt to the game they will receive a raffle ticket where they will have a chance to win gift cards, free winter formal tickets, and a signed Kobe Bryant Jersey. Please encourage your students to purchase one of these shirts. A PINK OUT Edition of TROJAN THURSDAY! Boys Basketball – The Boys Varsity Basketball Team dropped their first two league games on the road falling to Beckman and Northwood. Kiron Dey was the leading scorer in both games scoring 30 and 22 points respectively. Over Christmas break the boys participated in the Marin Catholic Tournament competing against some of the best teams in Northern California. The Trojans won the last three games to capture the Consolation Championship. Kiron Dey was named to the All -Tournament team. Senior guard Justin Wu and sophomore guards Alex Bray and Kevin Yahampath also played well during the tournament. The Trojans return to action Friday night for the home league opener against Corona del Mar in the “Pink Out” game. We hope to see you there dressed in Pink. Girls Basketball – The Lady Trojan basketball team finished 2015 with a second place trophy in the Coaches vs Cancer Palo Alto Tournament. Allison Piper was named to the All – tournament team. League play began but the team lost to Beckman and Northwood in two close games. Freshman standout Malia Goldsmith led in scoring in both games with 13 and 16 points respectively. Piper added 13 points against Northwood. These lady’s will hold the annual Pink Out game this Friday at 530pm. We hope to see you wearing your Pink Trojan Army shirt at the game supporting our girls. Boys Soccer – Our boys soccer team lost their season opener last Thurdsay to Beckman by a final of 3-2. Riley Duncan and Sam Kelley scored goals and Faris Qaisi offered up both assists. On Tuesday, our boys defeated Northwood by a final of 1-0. Riley Duncan scored early in the game and Sam Kelley gave the assist. Goalkeeper Ameen Beheshtaein recorded the shutout. Our boys travel to CDM this afternoon for an important league match. Girls Soccer – The Lady Trojans have had a rough start to League play, dropping two away matches against Beckman and Northwood. The Beckman match was particularly frustrating as UNI felt it was the stronger side, generating lots of offense but unable to find the back of the net. These two games came after a strong 4-1 win over Costa Mesa to round out the pre-season schedule. Paige Metayer continues to be a handful in the midfield, knocking in UNI’s lone goal against Beckman. Leila Sedehi works tirelessly in the midfield, making her presence known all over the field, both offensively and defensively. Defensively, Michelle Maddox’s composure and communication on the back line have saved many shots. The team is back in action today here at UNI against CDM – it promises to be an exciting match, so come out and support! Girls Water polo – Girls water polo currently has a 12-8 record on the season. Today the Trojan varsity team hosts CDM at UNI pool with a 3:15PM start. UNI traveled to Northwood this past Tuesday Jan 12th and was victorious with a score of 6-3. The girls also had a winning record of 3-2 placing 4th overall at last weekend’s 5 Counties tournament in Riverside beating Santiago of Corona, Lakeside of Elsinore, JW North of Riverside and only losing to Yucaipa and Vista of San Diego. Shawna Kedzie leads the Pacific Coast League in scoring and is top 3 in Orange County while Sophia Bajak and Chandler Denaro have high stats in steals, assists and scoring as well. Good Luck today girls! Wrestling –Wrestling is off to a solid start in League play. With all three levels at an impressive 3-0 record, Trojan Wrestling is hoping to finish strong and take the PCL title. Last week, the varsity Trojans faced Northwood in a blowout, 76-6. Lead by captain Danny Gilbertson (12) who won by pin and Max Hertz (11) who won by pin, the team never looked back as it took an early lead. Last night at their GOW, the Varsity Trojan wrestlers continued undefeated by slipping past the Seakings in a 39-30 nail biter that came down to the final matches. Helping to clinch at least a second place finish in League, newcomers Kohl Hertz (9) and Ethan Chin (9) both rallied for hard fought victories while veterans Danny Gilbertson, Max Hertz, Zachary Taha (12), and Ibrihim Takesh (12) did their part to ensure the win. The Trojans hope to extend their record next week away against top seeded Irvine wrestling. Good Luck Boys. 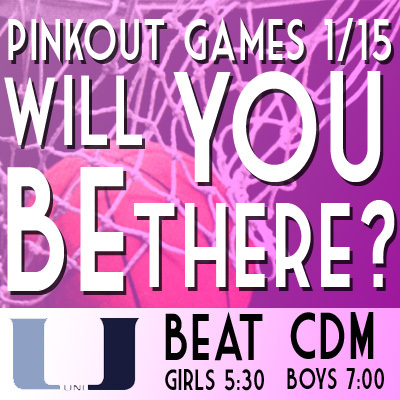 Pink Out – Tomorrow is a Pink Out on campus to get everyone ready for our Pink Out basketball games Friday night. Our girls play at 5:30 and our boys play at 7:00. We do still have some Pink Trojan Army shirts available in the athletic office for $8. If you are going to the games tomorrow night make sure you are wearing Pink. Winter Sports Pep Rally – Tomorrow we will have our winter sports pep rally. The energy on campus will be amazing as everyone on campus is excited for the Pink Out. This winter rally gives us a change to recognize all of our varsity winter sports. Twitter is taking off – We launched our @UNI_Athletics twitter site last year and it took some time for it to catch on. This year alone we have had 180 new followers. If you have a Twitter account and would like updates on how our UNI athletic teams are doing, you can follow us @UNI_Athletics. It is another way to highlight our athletic teams and star performances by our athletes.